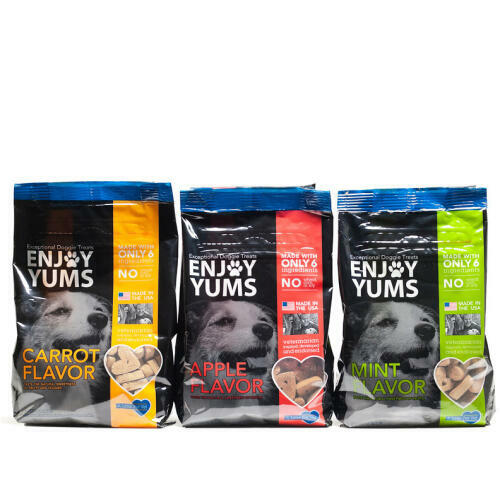 Enjoy Yums Doggie Treats are made with all-natural, premium human-grade ingredients with no added sugar, artificial coloring or preservatives. They are inspired, developed and endorsed by veterinarians and sweetened with the natural goodness of fruits and vegetables. They're so tasty, even picky eaters love them! 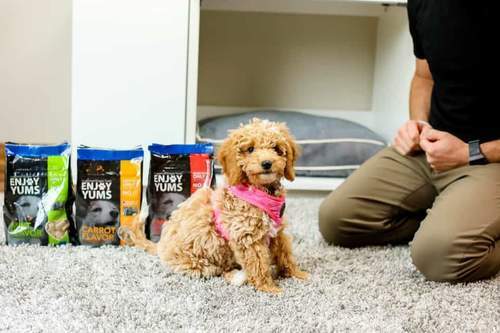 The healthy and delicious nature of Enjoy Yums Doggie Treats means they are perfect for training and positive reinforcement. The texture of the treats also helps in the prevention of tartar buildup on your dog's teeth. The main ingredient in Enjoy Yums Doggie Treats is rice bran. It is not only the most easily digested grain but it is nutritionally beneficial, providing top quality fiber for digestive health, protein for building muscle, and omega-3 and -6 fatty acids for a healthy skin and lustrous coat. The treats also contain steel cut oats with beneficial fiber to keep the digestive track healthy, while both rice bran and steel cut oats have hypoallergenic tendencies. Refreshing mint flavor. Made in the USA. Ingredients: Rice Bran, Steel Cut Oats, Oat Flour, Unsweetened Applesauce, Honey and Peppermint Oil.